I have a problem. I am addicted to meringues. The crunchy outside with a slightly softer, chewier center. The lightness and many possibilities get me every time. 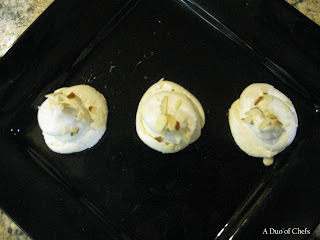 My addiction started as a child when my mom would make what we dubbed "overnight cookies" around Christmas, which were meringue cookies with chocolate chips and nuts that after baking were left in the turned off oven overnight to dry out the meringue. My grandma used to also make a Raspberry meringue dubbed "pink cookies" that she would have to hide until after dinner because they would disappear if she didn't. I didn't start experimenting with meringues until a I had my own place. I remembered making meringue cups in my high school cooking class so that's where I started. Then I experimented with Peppermint meringues, that have since gone on to replace those overnight cookies around Christmas time. These were my favorites until they were recently overthrown by America's Test Kitchen's Toasted Almond Meringue cookie. And to think I would have never discovered these if we hadn't gotten the The Best of America's Test Kitchen 2009 cookbook for Christmas. Not only did these meringues have a complexity thanks to the pinch of sea salt and toasted almonds that decorate their tops that bring out an almost buttery flavor in the cookie, they also have the most perfect texture. Once baked, the delicacy of the egg whites are perfectly preserved -- something I had never obtain with other meringue recipes in the past.